When it comes to architectural metal fabrication, sometimes we do our best work under pressure. That was certainly the case in March, when a downtown Indianapolis restaurant, The Tilted Kilt, needed to create an outdoor bar area in time for the NCAA Final Four. A big sponsor had rented the area, so it needed to be ready ASAP. Our job was to create the railing trim and drink shelf around the bar area. Sounds easy, right? With the right tools and a little creativity, it was. Here’s what happened. The architect had created precise drawings of the railing system and fencing around the bar area. 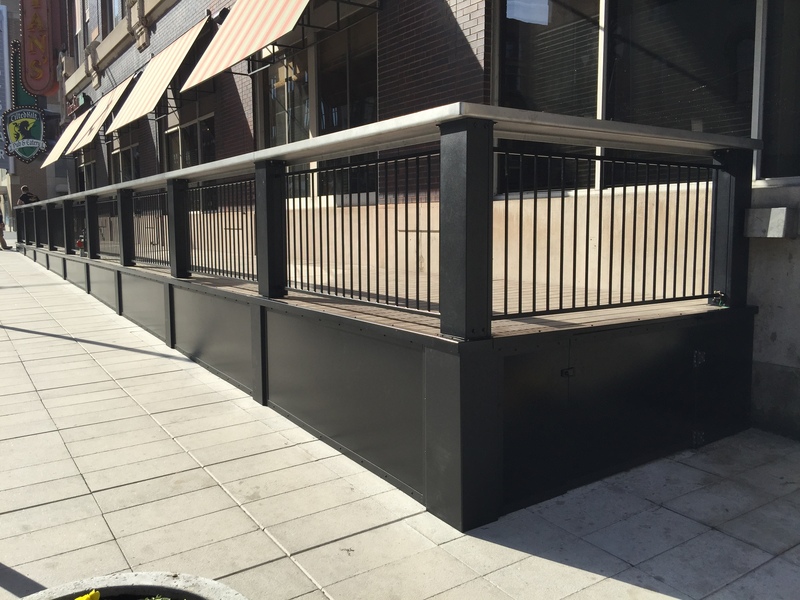 It looked really nice, with attractive fencing and trim work and a little drink shelf all the way around – great idea! Unfortunately, we needed to build on top of a wood deck that was not built with aesthetics in mind. There was a big swell in the center – so if we ran the railing parallel to the deck floor, the drink shelf would rise and fall. Also, the 4 x 4 posts along the edge of the deck weren’t aligned. They were inconsistently spaced and jogged back and forth by an inch or more. Our challenge was to build a straight fence over a not-so-straight post system – and make it look good. Architects care about this. They want a certain look. They want continuity. So do we. For a moment, we considered chopping off all the posts and resetting them! But instead we decided to get creative and build a solution back in the shop. We measured the site with lasers and then constructed metal boxes that would go over those posts. Each box is 6 x 84. But these weren’t simple boxes – they were adjustable three ways: up-down, left-right, and in-out. That way we could place them over the posts and then level them out with a plumb line so they were completely, perfectly aligned. This allowed each fence length to be exactly the same dimension. In addition to the installation challenge, we had a materials challenge. The specs called for stainless steel fencing between those posts. In recent years I’ve noticed stainless steel is not what it used to be. Today’s 304 stainless has a lot of impurities in it – especially a lot of carbon – and that means it tends to get little rust spots. You can lessen that problem with a process called passivation. Or you can eliminate the problem by going up to a 316 stainless steel. After consulting with the architect, that’s what we used for this project. It cost $2,000-3,000 more, but will live in perpetuity with no rust specks. 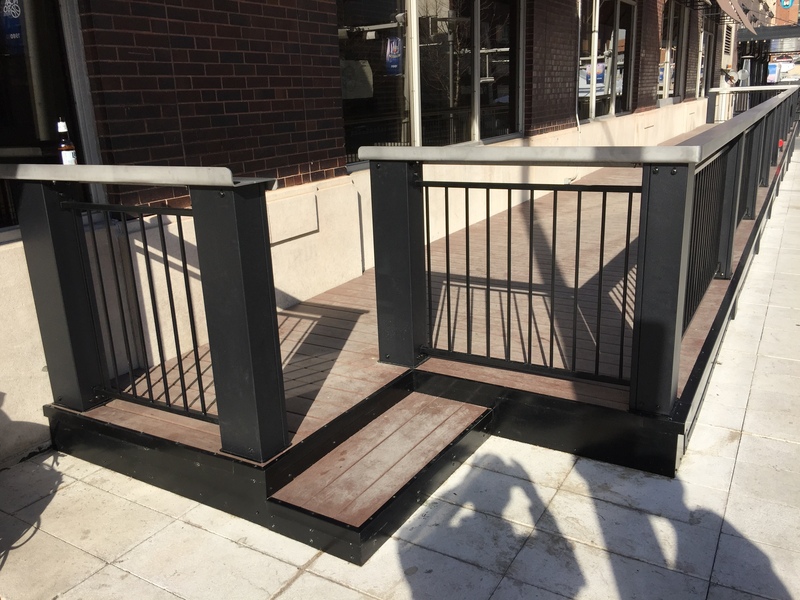 When you look at this deck, you’d have no idea the railing system was all built in two weeks. You’d have no idea those metal posts have a cavity inside to hide 4 x 4s that are jogging back and forth. You’d have no idea the stainless is medical grade so it doesn’t rust. All you’d notice is the little details that make it look great. That’s where engineering and design differentiate high-quality metal fabrication from everything else.